Why should we be talking about scaffolding safety? A scaffolding safety toolbox talk should be at the top of the priority list for most construction and industrial companies. Scaffolding consistently ranks as one of the most incident inducing pieces of equipment and activities on industrial sites - and continues to cause thousands of injuries and deaths on these sites the world over. One of the major dangers of scaffolding is that workers on site become complacent working on and around it. And for good reason, scaffolding is a central part and mainstay on almost all sites - so people get used to it. But it's this type of complacency and lack of safety awareness which can cause serious injuries and even deaths. So in addition to the very real dangers of scaffolding, a scaffolding safety toolbox talk enables companies and toolbox talk coordinators to cover scaffolding safety in an informal yet relatively comprehensive manner. When you are conducting a scaffolding safety toolbox talk, workers can provide feedback to the current state of the scaffold, any site specific hazards they have noticed - and to foster a discussion around the importance of maintaining high scaffold safety standards. As is the case with most site safety, scaffolding safety starts on site, and conducting scaffolding safety toolbox talks is a great way to get vital information onto the ground. The brief and concise nature of toolbox talks means that you won't be able to cover every element of scaffolding safety in a single talk. In fact, scaffolding safety is a topic which you should look to re-visit on a pretty frequent basis, especially because the state of scaffolding and its associated hazards can change and evolve dramatically over the course of a project. 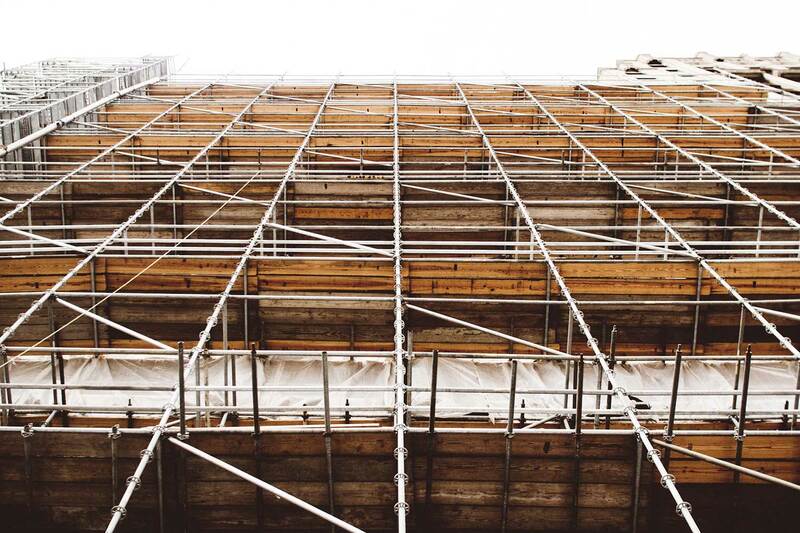 You can dive a bit deeper into many of these topics by reading through our scaffolding safety tips here. 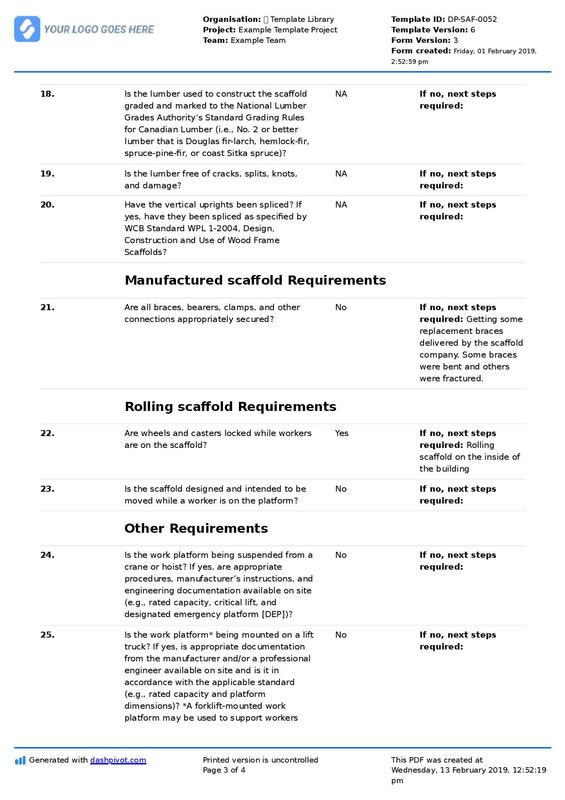 As you can probably already see, there is a lot of scaffolding safety information to be discussed and learned. The best way to pick which topics to cover is to first prioritise any recent scaffolding hazards or incidents and cover those. They are the most urgent. Secondly, context is the most important engagement factor in toolbox talks - and it's what makes toolbox talks such a powerful tool for site safety. You can literally stand by scaffold on your site and draw attention to specific hazards, or issues - and physically show workers what you are talking about. The closer and more contextual you can get around how people are actually interacting with scaffold every day, the more engaged and useful your discussion will be. So now that you have a few good ideas for your scaffolding safety toolbox talks, what does a scaffolding safety toolbox talk look like in real life? 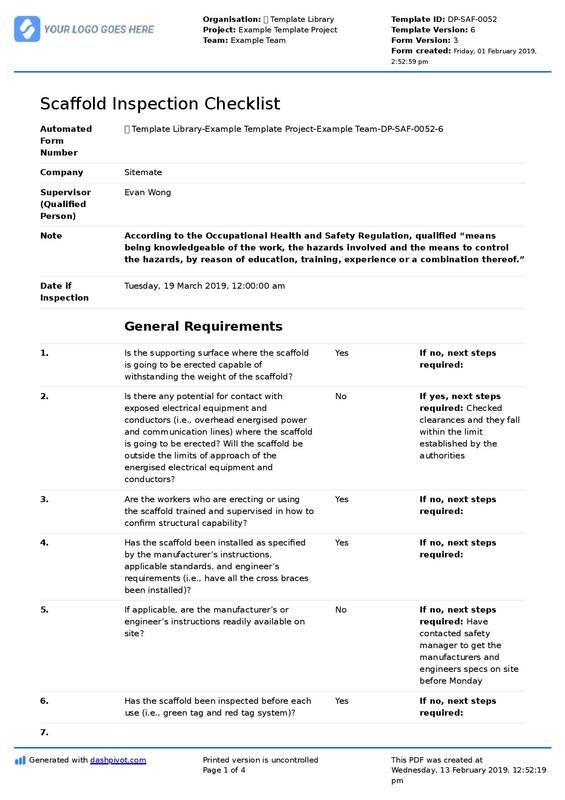 We have an example PDF export below which you can look at for inspiration, and to understand how you can get the most out of documenting your toolbox talks. These few topics probably took a good 10 minutes to cover in some detail. You can also see that each scaffold discussion topic has some associated actions to be taken and a person responsible for those actions. Turning your scaffolding safety toolbox talks into actionable activities is one of the easiest ways to quickly improve scaffolding safety on your sites. If you include a couple of action items for every discussion topic on every toolbox talk, you'll soon have a self-perpetuating safety machine which solves hazards and dramatically reduces the chances of issues getting missed or of negligence surfacing. Part of being able to document and action your scaffolding toolbox talks comes form having good processes and documentation. 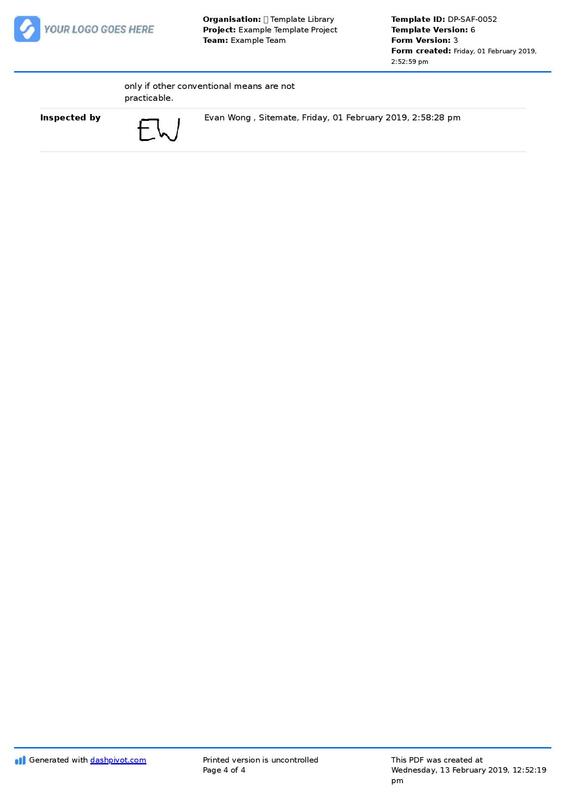 The PDF export below was pulled from Dashpivot, a digital tool for capturing, organising and tracking all site information. 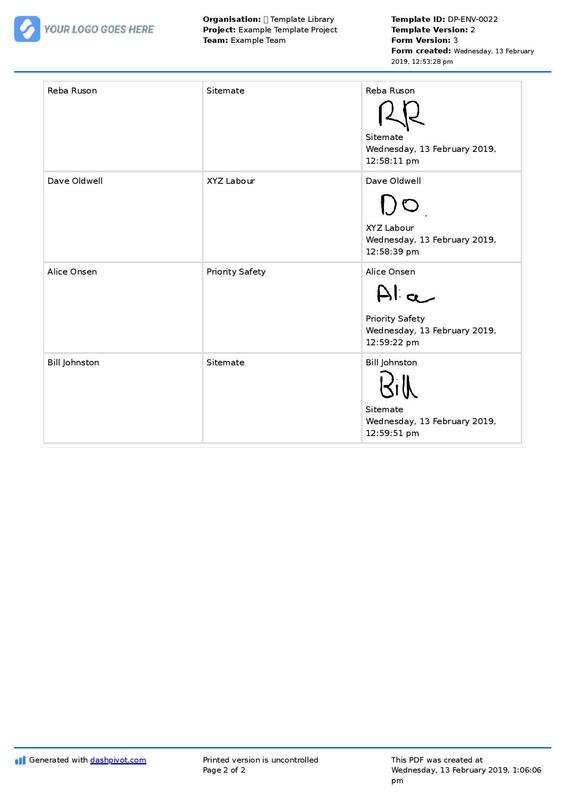 Use and edit this example scaffolding safety toolbox talk for yourself. In addition to focusing your toolbox talk efforts on scaffolding safety, there are some other low hanging fruits for improving scaffolding safety. A few of the more obvious ones are ensuring that your workers and teams are adequately trained for working on and around scaffolding, showing people how to create and prepare a comfortable and organised space to work on scaffold, and how to spot weak or defective scaffold, bases or brackets which can damage the integrity of the entire structure. The single most powerful tool you can use and optimise in order to improve scaffold safety is the scaffold inspection. Managing and performing scaffold inspections properly enables companies and teams to spot most scaffold hazards and eliminate them before they become major issues. When performed well and on a frequent basis, these inspections are your most reliable scaffold safety tool. Use this framework for your own scaffold inspections. By covering scaffolding safety in your toolbox talks, and by taking advantage of the inspection tools and software covered here, you can improve your scaffolding safety starting today. The most dangerous equipment and activities on construction and industrial sites are often the most common ones - and they usually involve the capacity to fall from heights (which consistently ranks as the most frequent cause of injury and death). Working on and around scaffolding carries with it a number of risks; risks which you can reduce by creating a workforce which is more knowledgable, better trained and more cognisant of scaffolding safety every team they see it, stand under it, or scale it to get the job done. This toolbox talk structure is quick and easy to complete and signoff on site, and keeps all of your toolbox talks neatly organised and professional. 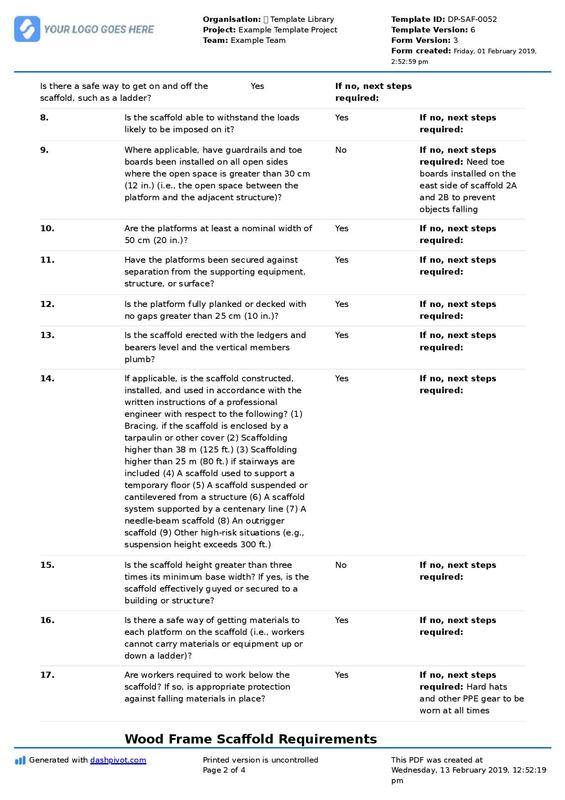 Conduct thorough and safe scaffold inspection checklists directly from site using this daily or weekly scaffold inspection template. People in 80+ countries use this safety management system to improve their scaffolding safety, and safety across other site activities.